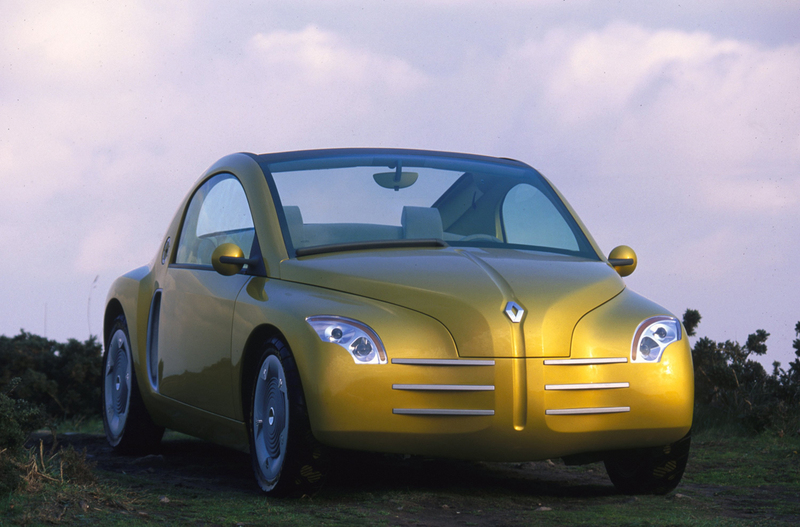 Possibly inspired by the Nissan Pao and Figaro, Volkswagen looked towards its storied past and developed the Concept One that was presented to an enthusiastic audience at the 1994 edition of the North American International Auto Show. 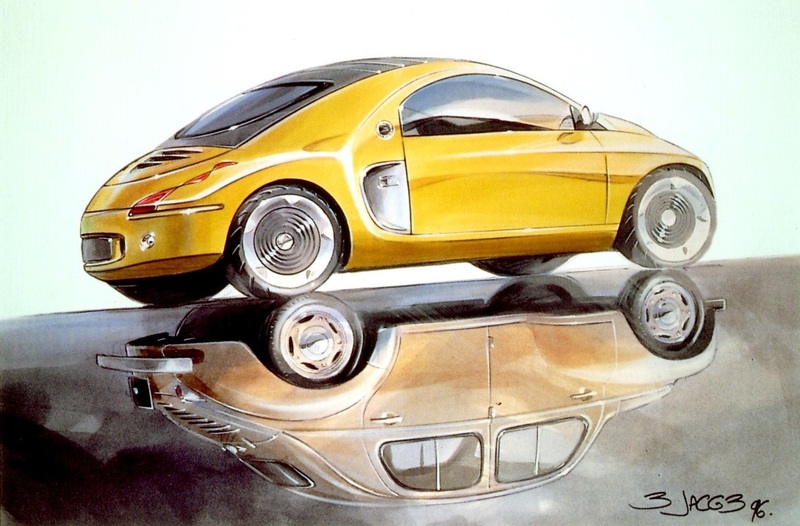 The Concept One was a daring, futuristic show car that borrowed a healthy dose of design cues from the original Beetle. The Wolfsburg-based automaker was slow to bring the concept to showrooms for a multitude of reasons, and rival Renault took advantage of the delay to steal the spotlight and show off its own retro-styled concept in 1996. Christened Fiftie, the car was designed to celebrate the 50th birthday of the 4CV. Styling cues such as a three-slat mustache grille, a pointed front end, bulging fenders and louvers on the rear decklid created an unmistakable visual connection between the Fiftie and the 4CV. The overall shape was also reminiscent of the 4CV but keen observers pointed out the Fiftie bore more than a passing resemblance to the 4CV-based Alpine A106. Considerably more advanced than it looked, the Fiftie featured a carbon fiber body mounted on a lightly modified version of the aluminum chassis that underpinned the Renault Sport Spider. It boasted a roof made up of four removable panels that could neatly stow away beneath the rear window for open-air motoring. Wheels that were noticeably inspired by the five-lug, star-shaped steelies fitted to early 4CVs and an air vent in front of the rear wheel arch finished off the period-correct look. Inside, the Fiftie featured a sofa-like bench seat with room for two passengers and a large center console. The bench seat was fixed but the steering wheel and the pedals were both adjustable, a setup borrowed from the world of Formula 1. A large screen mounted in the middle of the dashboard ran a software that grouped the car’s entertainment, climate control, driver assistance and telephone functions into a single unit. The feature made it possible for designers to fit the Fiftie with a simple, function-oriented dashboard and it raised more than a few eyebrows in an era well before the word “infotainment” became de rigueur in automotive press releases. Fully functional, the Fiftie was powered by a Twingo-sourced rear-mounted 1.2-liter four-cylinder engine that sent 60 horsepower and 46 lb-ft. of torque to the rear wheels via a five-speed semi-automatic transmission. Performance figures were never published but the lucky few that got to spend time behind the wheel reported the Fiftie was brisk and lively to drive thanks to its low weight. The Volkswagen Concept One led to the New Beetle in 1997 but the Renault Fiftie was never given the proverbial green light for production and it remained a one-off concept. All photos were kindly provided by Renault’s archives department. Cool, let me know if you can find it. I really don’t like the exterior styling but I LOVE the interior. In fact I’d really like to pinch that interior colour scheme and general design and put it in a Series Land Rover. It is so bright and airy yet also retaining a lovely classic cosy feeling to it. It’s pretty good looking, yeah. From memory it was largely crafted out of natural materials such as cotton and linen.